This episode seems to have it all: scandal, fun, supernatural, romance, trouble and suspense. Jae Hui meets Tae Jun at the stairs. Much to her shock Tae Jun kisses her and someone takes a photo. Tae Jun smiles at Jae Hui in a rather silly way and faints. Jae Hui places him on a wheel borrow to bring him home. Sang Chu loses his leash and meets them at the entrance. He greets Tae Jun with a round of slobbered kisses. Tae Jun wakes up finding himself on his own bed, realizing that he'd been drink. On the other hand, Jae Hui thinks that Tae Jun knows that she's a girl. Too bad for her, Tae Jun cannot recall a thing and when she mentions about a kiss the only thing Tae Jun can think of is Sang Chu's doggie kisses. Eun Gyeol's date turns out that she already has a boyfriend. He did not mind it one bit because he had fun. He wonders though if a broken heart gets a transfer discount when taking a bus. Tae Jun takes Sang Chu to the vet for a checkup. While Tae Jun is trying to pay for his meds, the adorable dog sees a cat and runs after it. Eun Gyeol and Jae Hui wrestle with each other. Eun Gyeol excuses himself from Jae Hui after noticing that his heart-beat-o-meter is reaching breaking point. Inside the men's room Eun Gyeol convinces himself to get his act together. Tae Jun apologizes to Jae Hui for what happened yesterday. He also thanks her for saving Sang Chu. Jae Hui remembers that Eun Gyeol must still be waiting for her so she asks Tae Jun if she can borrow his phone to call him. Eun Gyeol's phone rans out of battery, as result neither Tae Jun and Jae Hui can reach him. Tae Jun and Jae Hui head back to school and on their way a bus throws water unto the side walk. Tae Jun, the gentleman that he is, covers Jae Hui from the onslaught of water, locking them in an embrace. Here comes the weekend and the dorms are in lock down due to ongoing pipe constructions. Jae Hui is jealous that everyone else has someplace to go. Eun Gyeol imagines taking Jae Hui to his house and day dreams about being kissed by the Kissing Master. Finally, he snaps back to reality upon hitting a pole, bleeding his nose and fainting. Seung Ri offers the gang to spend the weekend at his place, known as Paradise Pension, a pension house owned by Seung Ri's family, located near a beach. Boys being boys, they happily agree thinking that it's going to be a weekend at bikini paradise. Seung Ri greets his mom upon arrival. He introduces the group as "precious workers". They were tricked, Seung Ri invited them not to hang out but to help out on the renovations. Min Woo and Tae Jun arrive right after the group settled down. Tae Jun checks the place out with his camera and Jae Hui catches him looking at an incomplete picture of angel wings. She wittingly manages to take a photo of him with the set of wings as the backdrop. While handing back his phone, she compliments him that it definitely suits him. Back in Seoul, Han Na learns that Tae Jun is out of town for the weekend. She comes up with another idea, which is to follow him. At dinner, Chang Yoon, Seung Ri's mom right-hand man and pension house caretaker is extremely being nice to Jae Hui that Tae Jun can't help but notice. The gang enjoys a good conversation and in the middle of it gets a revelation that Min Woo is actually Seung Ri's uncle. Han Na arrives to join the commotion. Jae Hui goes for a walk and buys a pair of matching bracelets that light up. 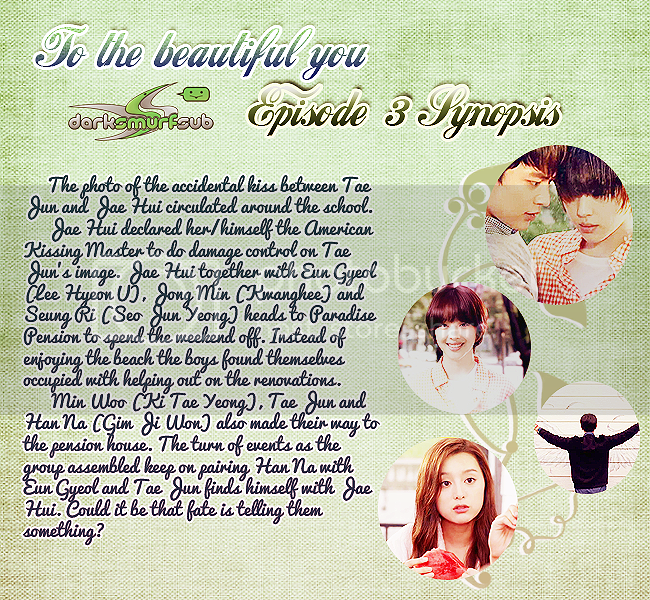 Arriving at the pension house, she finds Tae Jun together with Han Na and she decides to leave them alone. Eun Gyeol wants to verify something and to do so, he needs to take a bath with Jae Hui. He calls it a man to man approach. Jae Hui finally gets a rare chance to use the spa. She heads out after confirming from Hyeong Jae that no one is using it. Eun Gyeol also heads to the spa knowing that Jae Hui is using it. Chang Yoon is about to open the door to spy on Jae Hui when Han Na thanks him. Jae Hui hears footsteps just as she was about to fully undress. She hides in one of the huge laundry baskets just as Han Na goes inside. Han Na sees the bandages Jae Hui left behind and ignores them after several failed attempts of calling out if someone is in the room. Han Na goes inside the tub and blocks out any noise by putting on her headphones. Eun Gyeol goes inside and sees someone in the tub, thinking it was Jae Hui he jumps right in. Han Na screams at Eun Gyeol and it wasn't enough so she hits him on the head causing Eun Gyeol to faint. He regains consciousness after seeing his deceased grandmother. Han Na hits him harder knocking him our completely. The next morning, Seung Ri's mom warns everyone that the last person to wake up will wash the dishes. Tae Jun while making his way down finds one of Jae Hui's bracelets that must have fallen off last night. Jae Hui who is always helpful decides to go with Chan Yoon. Tae Jun who has been keeping an eye on the doubtful guy, asks Jae Hui to buy him a new pair of slippers, that way he can contact her. Jae Hui puts on the bracelet and notices that she's missing the other pair. It could be lying somewhere around the pension house, but for now, she has no time to look for it. Off she goes to meet Chan Yoon.